A great and easy way to get from Charles de Gaulle Airport to the center of Paris. Air France buses offer, security, comfort and reliability. Both Route 2 and 4 will get you to the center of Paris where you can catch a cab for a few Euros or easily take the subway to your hotel. Note: both routes drop-off in safe neighborhoods. Air France Bus service is quickly becoming the travelers choice. Most passengers you'll meet on the bus speak English including the driver. Buses run from every half hour to and from Paris from 7:00am until 9:00pm everyday. 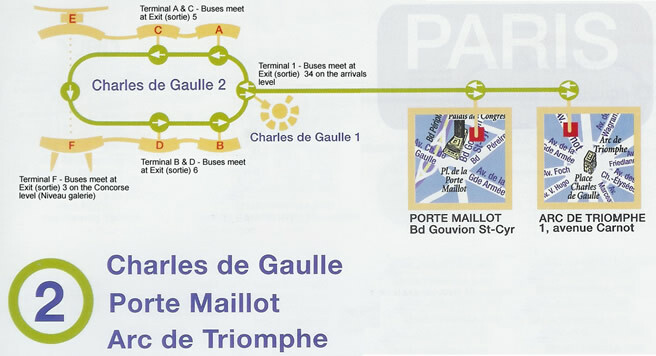 Non-stop service from Charles de Gaulle airport to Porte Maillot and the Arc de Triomphe. Buses run every half hour between 7am and 9pm. Non-stop service from Charles de Gaulle airport to Gare de Lyon and Gare Montparnasse. Buses run every half hour between 7am and 9pm. From Paris to Roissy-CDG: Bus leaves Paris center every 15 minutes from 05:45 to 20:00 and every 20 minutes 20:00 to 23:00. Average travel time is 60 minutes. 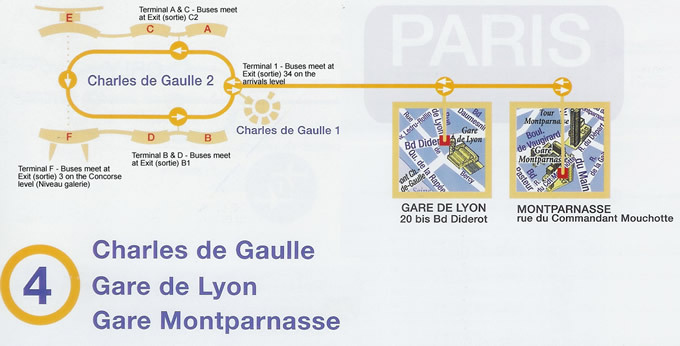 From Roissy-CDG to Paris: Bus departs every 15 minutes from 06:00 to 19:00 and every 20 minutes 19:00 to 23:00.